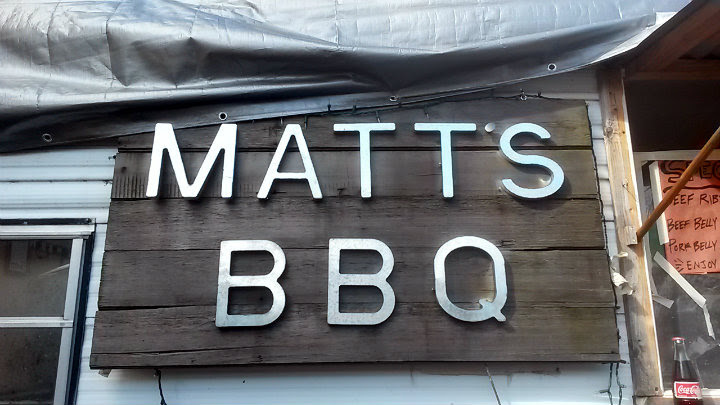 After an initial kickass experience here last summer, I returned to Matt's BBQ with some BBQ-loving friends. 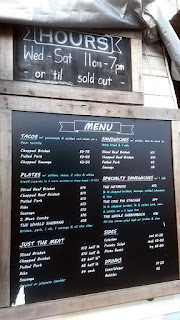 It also gave me a chance to try a couple other items on the menu that I did not have the first time. Matt's BBQ has remained among the elite BBQ places (and probably the top BBQ spot, depending on who you ask) in Portland. Even Guy Fieri stopped here to film a "Diners, Drive-Ins and Dives" episode. 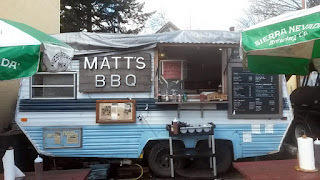 With increasing demand, Matt's got a new smoker in last month so they don't sell out as quickly. I got "The Whole Shebang" last summer to try as many proteins and sides as possible, and I still recommend that first-timers get this. 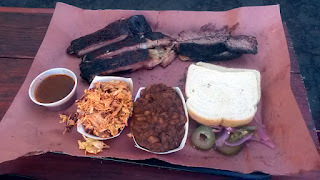 My friends opted for the two-meat combo with brisket, pork ribs, slaw, and beans. 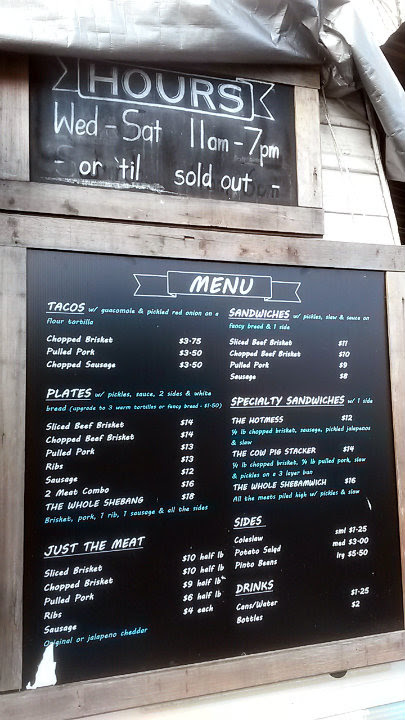 They had a permanent smile on their face, and they've enjoyed great Texas BBQ in Texas before this. 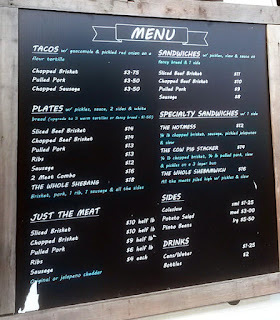 Still, there were a few items that I had yet to try. Matt's BBQ sells tacos in flour tortillas. 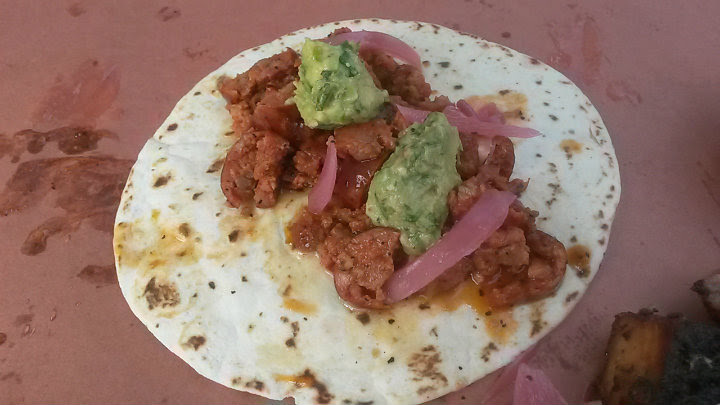 Meat choices include chopped brisket, pulled pork, or chopped sausage, with guacamole and pickled red onions on top. You'll probably want at least 2-3 of these for a meal, but considering how great they are, maybe a half-dozen should suffice. I just got one of the chopped sausage tacos for the usual panda science ($3.50). The sausage here remains my absolute favorite protein. I got the original sausage link this time, but I highly recommend the jalapeno cheddar sausage. 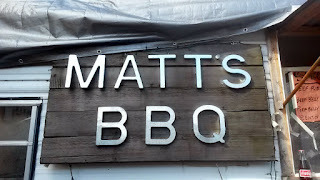 On Saturdays, Matt's will have monstrous beef ribs and burnt ends. 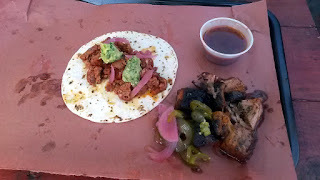 The burnt ends (generally a Kansas City staple) here are not from their brisket, as they just give you large fatty portions of brisket. Instead, Matt's burnt ends are made with beef belly or pork belly, then chopped up into extremely juicy and tender chunks. 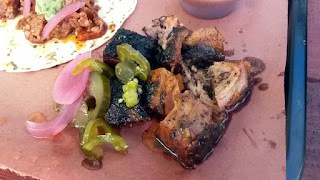 I got the pork belly burnt ends this time. 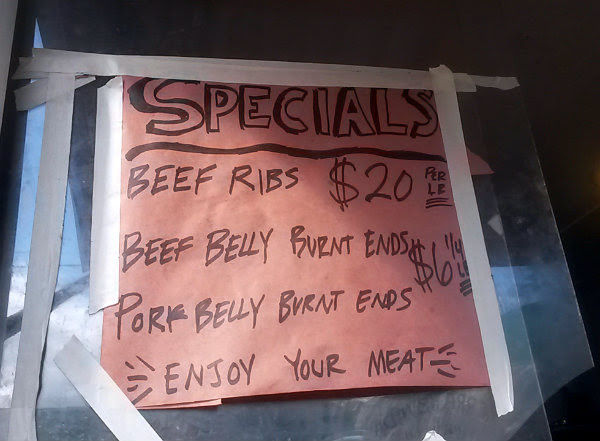 It's $6 for a quarter-pound, but dammit, sign me up for at least two pounds. Simply amazing and mind-blowing. 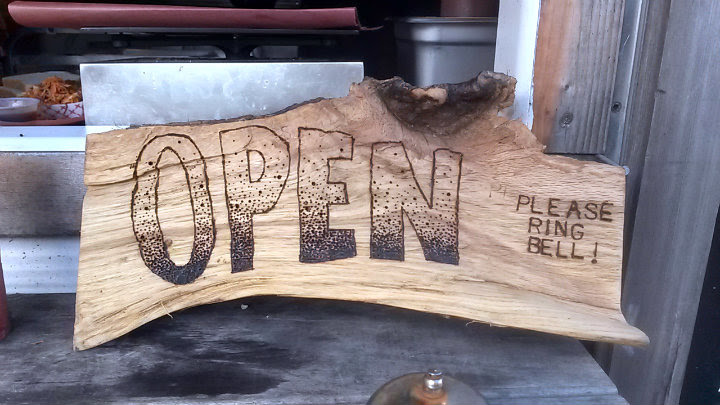 There's a steady flow of customers from the moment they open, so get here as early as possible before they start running out of food.